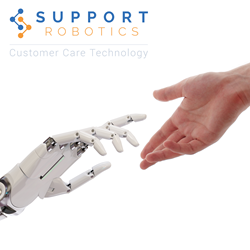 Support Robotics announces the launch of its next generation customer care platform for mobile network operators and retailers to simplify, automate and reduce the cost of mobile customer service. Support Robotics, a new entrant in the market for mobile customer care automation tools, has announced today the launch of a new software platform for mobile network operators, retailers and reverse logistics providers to simplify and automate mobile customer service processes across multiple contact channels. More than 2 years in development, the Support Robotics Platform is cloud-based and aims to bring a level of integration, flexibility and ease of customisation not previously seen in this market. Leveraging the latest digital and AI technologies, the platform, together with its mobile and desktop apps, is designed to support and intelligently assist many customer care processes. With its advanced Workflow Builder, clients can easily modify existing processes or develop and launch new processes to support anything from technical support to lease-swap or insurance use-cases with guided self-service, via app, web or chatbot. A wide range of diagnostics are provided for fault-finding, including extended duration tests for intermittent faults. “Telstra selected the Support Robotics platform to address a business need – to enhance and automate customer care experiences across different contact channels with a more modern, flexible solution. We have already delivered on a number of business initiatives and are planning more. We are delighted with the performance of the platform and the support we have received.” Mark Yarnall, General Manager Device Services, Telstra Corporation. Support Robotics Limited is a UK based independent technology development company specialising in software solutions for the support of connected mobile devices. Based in Cambridge, one of the UK’s main technology and innovation hubs, our team brings an innovative spirit and a wealth of knowledge and experience to the challenge of improving customer care for end-users and suppliers of smartphones and other connected devices. Our mission is to apply that experience and a fresh digital approach to deliver customer care solutions that are truly game-changing.